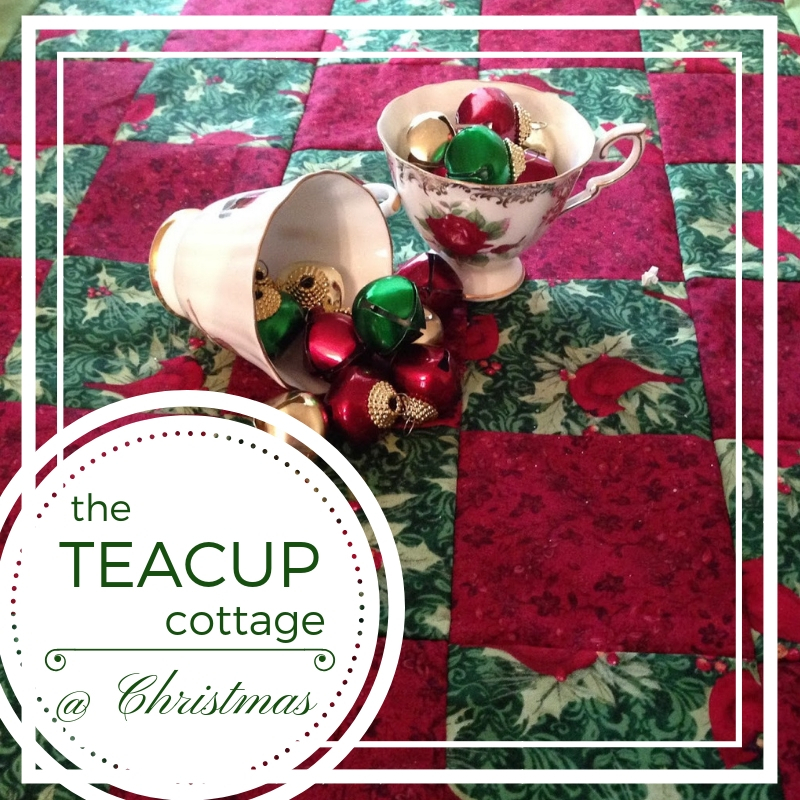 Christmas is upon us and I can not get enough of quick and easy projects during this time of year. 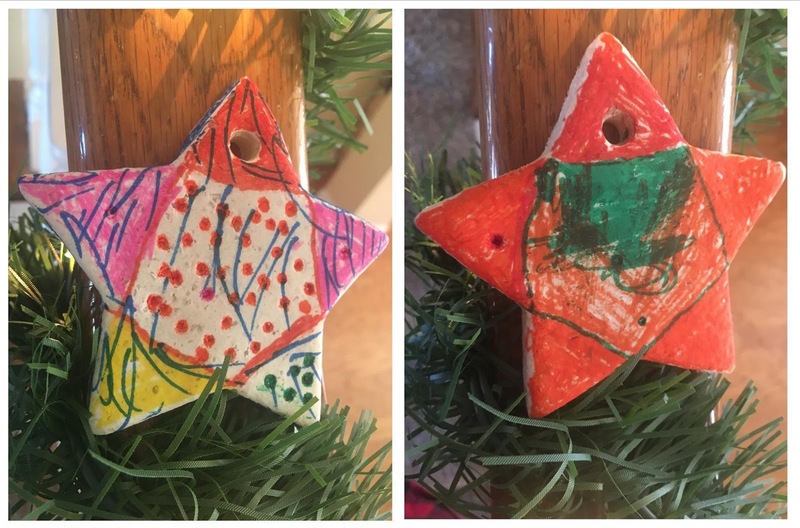 I used to do fun Christmas ornament projects with Lil Monkey (like these colored salt dough ornaments), but now that his is 8, I can barely get him to sit still for dinner, so I am back to doing solo projects. I have always loved cross stitch and if you've been a long time follower of the blog you may know that this is my "comfort craft", my area of confidence and in fact the first "needle art" I learned- somewhere at the age of 5. 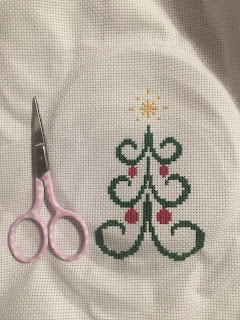 I have always jumped in with both feet with this larger cross stitch projects that that many sessions to complete, but have always loved tiny projects. You may have read my post about Christmas projects over the years last November. One of my favorites is the little stitched Santa I got along with a hand-painted one when my husband first deployed. Oh, how I miss those dear stitching friends, especially Meri from Meri's Musings Blog from those early years. I still follow her projects, but we don't chat like we did in those early days of Army life because life has taken us on some grand adventures along the way. It's so amazing how you can find comfort in friendships with people you've never met in real life, but I digress. Ever since those precious ornament gifts arrived at my doorstep, I have wanted to try my hand at tiny cross stitch projects. So this year, I decided it was the year to try. My dear sweet friend, and fellow Cub Scout mom, who I shall call OhEmG, recently moved into a new house and I felt like I wanted her to have at least one Christmas ornament that wasn't a "I had to buy these because like throws you curve balls". Adulting is not always fun, but now that her family is starting a new chapter, new memories are also on their way and I was hoping a little Christmas ornament would remind her of that when she unpacks each year. Isn't is adorable? Halfway through I knew I'd be making a second one for me. It's small because I stitched it on 18-count aida (that means 18 squares per inch for those who don't know). I wish I could find who designed it, I'll keep looking and add if I can figure it out. That's the difficult part of the internet for crafters, you can find all sort of images and such, but sometimes the design isn't credited or gets lost in countless reshares. The stitch count is 56x31 by my count. But so you don't have to do the math in your head, this is the size compared to a quarter. It took me 2 days from start to finish (Wednesday to Thursday), and I must admit this is the first time I have started and finished a needle art project without picking up another in the middle since probably hugh school. I'm a bit of a project leap frog type crafter, since I generally work on projects depending on my mood and deadlines. It was so satisfying to finish, I carried it around in my handbag all day yesterday just to enjoy it's cuteness. Not be let the excitement fade, my mom and I ended up going to JoAnn's while Christmas shopping yesterday and I picked up more aida and embroidery floss and when I got home at noon I started on this little guy. Isn't it cute, This was another Pinterest find, but I can say that the design was traced back to this blog on Pinterest and there are so many other cute projects. You'll have to have Google translate it for you, as I am partially confident in saying its in French (at least I recognize some words from my grandparent's speaking French in front of us as children.) Here is the project in a side-by-side comparison to my little scissors. I finished it in under 12-hours (with breaks for family stuff like dinner.) Last night I decided I wasn't going to put the tree stump or truck or whatever you'd call it, but now I think I want to do it in a brown, just to give it a little added color. I'm so excited to make more of these little projects, what do you think? Well, we are headed out this morning to go get our Christmas tree. I can't wait to share more projects with you later. **UPDATE: This morning we went to the Christmas tree farm to get our Christmas tree, and when we got home everyone opened up their individual box of Christmas ornaments and I found 2 more cross stitch Christmas items that I had forgotten about. I remember making a mini bolster roll type ornament for the person I sent my project too. I wish I had made myself one that year too. But the second find was this Christmas wreath in a Mason Jar lid I made in high school. I do not recall one Christmas tree memory as a child, but I think it was because it t was decorated by my step and half siblings while I was visiting my mom for Christmas, so this sat in a box for years. Once I got to college and was living on my own, I made sure to have a tree in my apartment, I usually got a small potted tree. It wasn't until I was 26 and married that I started to put a big tree up in my house (though my mom and stepdad did have a tree when I visited). 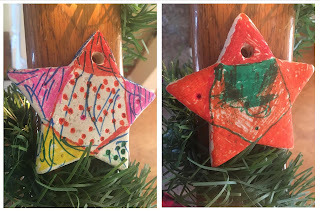 Needless to say, I had lots of years to make up for making tree ornaments! This little ornament has seen shinier days, but I love it. And I can't remember the last time I saw gold Mason Jar lids.